The Tech Blog: How to Use iMessage on PC? How to Use iMessage on PC? iMessage is Apple Inc. messaging app which used to do chat with iOS to iOS device. Apple has released so many interesting product like iPhone 6, iPhone 6 Plus, iPhone 7, Mac and much more. There are numbers of user in the world who are using iMessage on their iOS device for messaging to their friends. But there are Apple fan exist in the world who are die hard fan of Apple product but not able to use iMessage. These all users are use Android, Windows operating system and Apple iMessage is restricted this all device. Today I am going to tell you secret about how to use iMessage on PC (Windows) and give the answer of user who are searching how to get iMessage on pc on internet this day. So get ready to use iMessage app on Windows computer. Step 1: You need a Mac with iMessage and one PC with windows. Step 2: Now, Download chrome on both the system, and Chrome Remote Desktop using this link. Step 3 : Follow the instruction to connect both the PCs and enjoy iMessage on your windows computer. You can follow this step on your Windows PC and use iMessage for Window system. There are other ways available to get iMessage on PC. 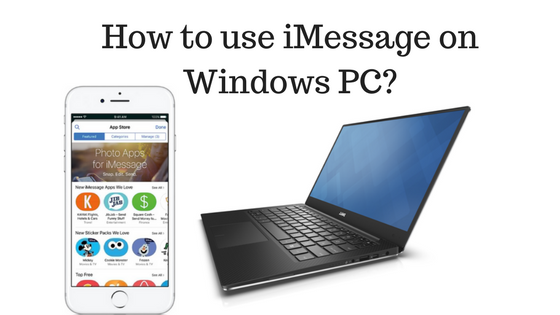 Learn how you will able to use imessage on pc.